What can you do in three hours and 48 minutes? That’s a pretty quick round at your Club, a road trip from Toronto to Detroit via Highway 401, or the total commute time to and from work during one of 2019’s many snowstorms. So why three hours and 48 minutes? That’s how long some lucky Members sat in a WestJet bird to get to paradise… in our case Punta Cana, Dominican Republic for the first annual ClubLink Punta Cana Championship. Of course that’s if you ignore the drive to the airport but with no customs to clear at Pearson it’s basically the same process as your average domestic flight to Saskatoon. Once we arrived we settled in for the week at Sanctuary Resort in Cap Cana which is only a 15 minute drive from the airport. Sanctuary is a quiet high-end adult only resort that focusses on a luxury themed experience for its guests. “The service at Sanctuary is amazing. You can’t venture out into the resort without seeing a smiling face asking you if you need anything. I immediately noticed their attention to service levels,” said event participant Glenn Townsend. Sanctuary’s room types start with a generously sized open concept suite all the way to stand alone houses. Located less than 10 minutes from the resort, Punta Espada Golf Club is consistently ranked as one of the best golf courses in the Caribbean. Luckily for participants all four rounds of the event were played there which was a remarkable golf experience as the course was in pristine condition. 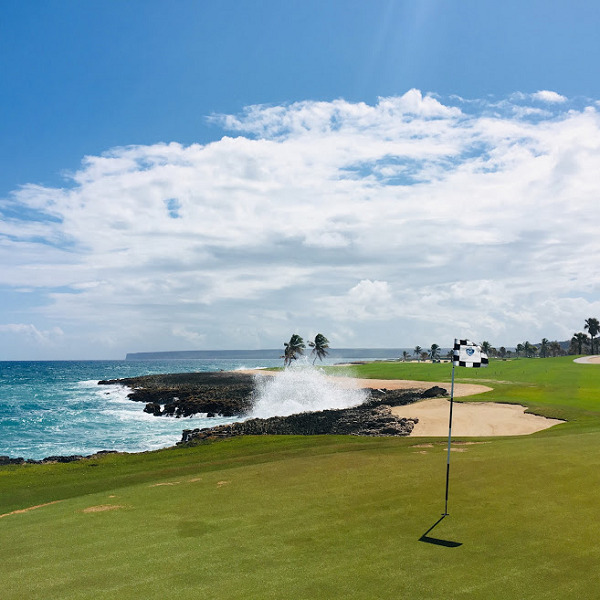 Also, almost half of the holes at Punta Espada are on the ocean and the views of the coast and waves crashing on the jagged shoreline, often close enough for players to get kissed by mist, can make you forget it’s your turn to play. Typical of a Jack Nicklaus design, Punta Espada isn’t particularly difficult off of the tee, but it knows how to protect itself. Like desert golf there are rock covered areas beyond the rough that create a ton of visual definition from the tee but they can be challenging to extricate your ball from. Back in the fairway it’s often smart to be short or roll the ball up to the green as on seven of 18 holes the Caribbean Sea waits to swallow up approach shots hit with a tiny bit too much gusto. The same goes for shots the least bit wayward of the “postage stamp” sized greens. One more hole, the par three 4th, has players hitting their tee shots away from the ocean and over a large tidal pool while still just a few feet from the waves. Needless to say a lot of balls made their way to Davy Jones’ Locker on this trip. playing there doesn’t actually feel arduous as any difficulties are quickly overcome by a general sense of awe at the surroundings. Regardless of what’s written here or what pictures you’re looking at, none of it can do this place justice. You’ll have to come see for yourself! It’s only three hours and 48 minutes away.